The spokesman of the Global Sri Lanka Forum –Australia Ranjith Soysa in a letter to President Maithripala Sirisena urged the political leaders of the country to record their protest when the Office of Missing Persons (OMP) commences its operations. The Office of Missing Persons was set up by the Yahapalana government who created an unprecedented record in co-sponsoring the OHRC resolution on Sri Lanka in 2015 as one of the four transitional justice mechanisms. The legislation to set up the OMP is one of most uncouth steps taken by a sovereign country against its citizens, in recent times. It is not merely an office but a fully-fledged quasi-judicial institute with wide powers to compel giving evidence and producing documents etc., with untrammelled authority, with access to any premises, including Defence Services units at any time. The OMP has the power to bring in foreign personnel to perform a wide variety of functions. It is not controlled by any accepted basic rights such as having to work within the Evidence Ordinance and can perform tasks in complete secrecy. The operational information of the OMP will not be available even to the highest court in the land. One of the most disgusting features of the OMP is its definition of the Missing Persons when it refers to ” missing in the course of conflict which took place in the Northern and Eastern Provinces ” It is very clear that the OMP was set up to please the LTTE supporters and the fee-paying NGOs and activists by focusing attention only on the Northern and Eastern provinces in Sri Lanka whereas the issue of missing persons can be applied to the entire island from the 1970s. Among many other questionable as well as immoral sections pertaining to the OMP, is its power to initiate investigations of complaints received in complete secrecy and OMP officials are to preserve its confidentiality. The OMP acting on nameless, faceless allegations, is empowered to report to the concerned law enforcement authority and is a danger to the country and its people, especially to the country’s defence forces. To add insult to the injury, one of most vocal anti-Sri Lankan NGO representatives, Nimalka Fernando had been appointed as a commissioner for the OMP. It is a well-known fact that Nimalka Fernando had been not only an avid critic of Sri Lanka’s war against the LTTE terrorists but also a staunch supporter of separatism. One can gauge to what degree the foreign-maneuverer OHRC is attempting to throttle the Sri Lankan armed forces by this blatant act of the appointment, just to add weight to the already heavily biased, uncouth OMP legislation. In short, the jury and the judge will be one and the same authority in deciding to decimate sovereign Sri Lanka and its law institutions and the defence forces. 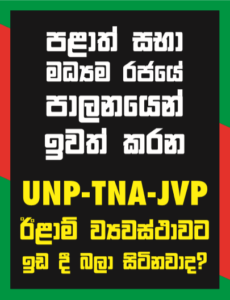 We request the people of Sri Lanka and its leaders who value the country’s sovereignty to come forward and register their protest when the OMP commences its unlawful and underhand operations.